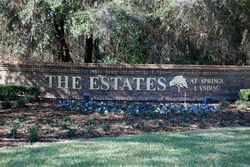 The Estates at Springs Landing is a well established community developed in the mid-80's. The community is located in Longwood within the upscale Markham Woods Road corridor. The homes here are on larger lots and features a community pool, tennis courts, playground and clubhouse-recreational facility. Shopping, restaurants and convenient ammenities are close by. The 434 & I-4 interchange is conveniently located near the community for an easy commute.